Following is a very spooky video of President Trump addressing the nation at the annual White House Christmas Tree lighting ceremony. At the 4:50 mark you begin to see a laser dot move around on President Trump’s body, from his face to his chest. For those familiar with firearms, they know that certain firearms are equipped with a laser sight or laser pointer to mark targets. Some believe that the laser dot is a red-eye reduction feature of a camera in the journalist pool, which makes no sense to me. 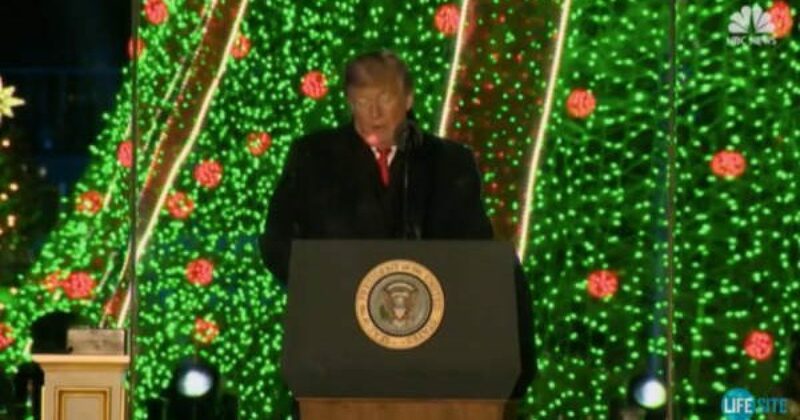 Others believe the dot is a reflection of the tree lights, which makes even less sense since the dot moves around on President Trump’s body while the tree lights are stationary. Now we have the reason why he got taken out of the Christmas tree lighting ceremony abruptly last night – he had a laser dot on him. it was clearly a laser. My guess is it was a laser pointer But it definitely was a laser, and was a threat. Abrupt stop at 38:30 true!!! Very odd!!! 2018 Christmas Tree Lighting with Laser marks on @POTUS speech at 1:34 mark onwards… white and red laser lights on podium and his face… God keep @POTUS safe!